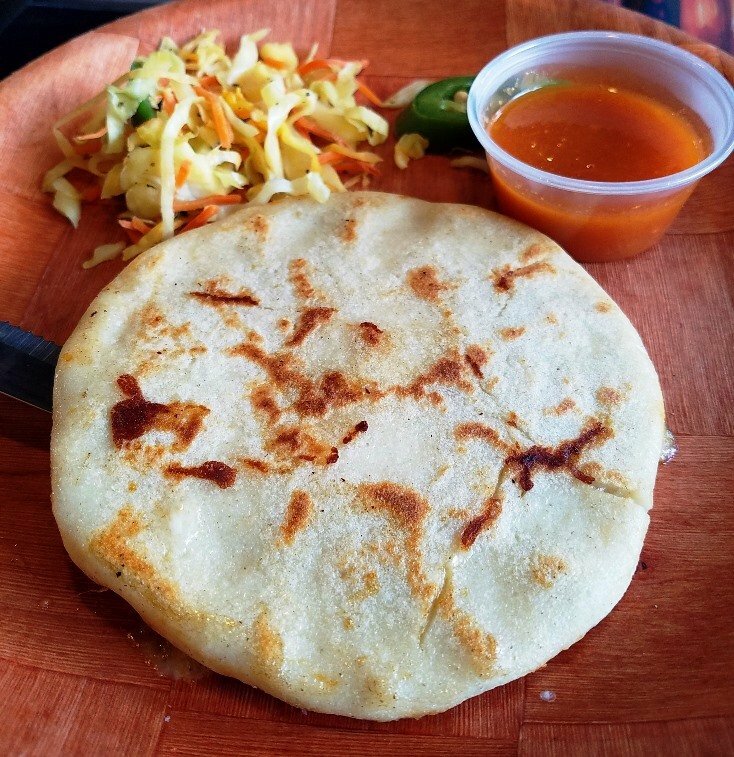 First Take: Las Marias Tacos y Pupusas in Raleigh for Authentic Mexican Fare! When it comes to Mexican eats, the situation reminds me of Chinese food. 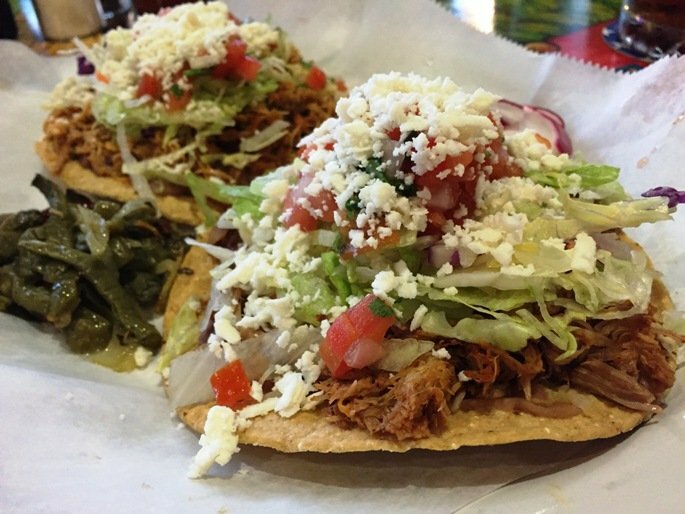 In that there are so many different types of Mexican eats in this food category ranging from Americanized Mexican to more authentic taquerias and taco shops. And I’ll eat it all, but I’m usually searching for Mexican eats that are a bit more authentic to explore the cuisine. 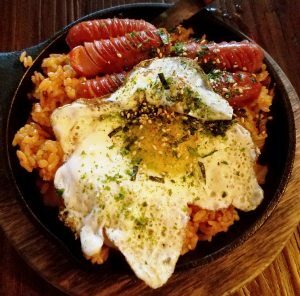 Thankfully up on Wake Forest Road in Raleigh, you’ll find a bunch of more authentic Latin-American dining options. One restaurant that I’ve been hitting up from time to time is Las Marias Tacos y Pupusas. It used to be La Fonda y Birriera Jalisco, before transforming in to Las Maria Tacos y Pupusas in its latest incarnation. Las Marias Tacos y Pupusas is conveniently located across the parking lot from WalMart if you need to pick up a 12-pack of paper towels. So navigate those treacherous parking lanes and pull up into that lot that sits off of Ronald Drive. It’s a humble storefront with a big sign so you can’t miss it! Inside is where Las Marias Tacos y Pupusas starts to get really interesting. The dining space is super bright, colorful and cheerful. The pale yellow walls are accented with greenery and Mexican statuettes. 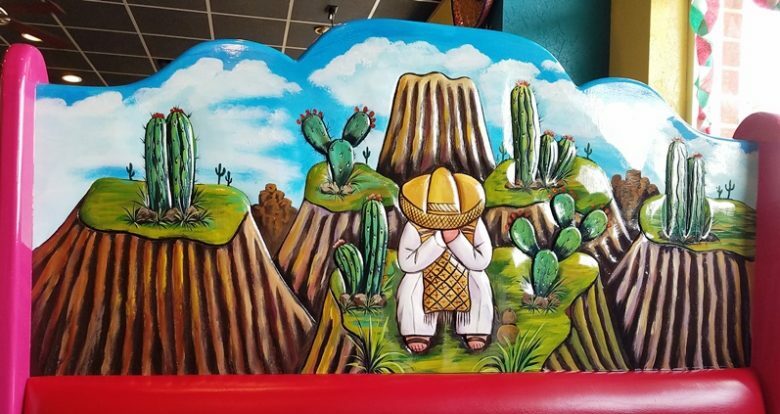 The seating at Las Marias seems to be all hand-carved and painted wooden chairs, booths and tables, showing off a variety of Mexican artwork and kitsch. Looking around, each piece seemed to be unique and one-of-a-kind, very cool craftsmanship! 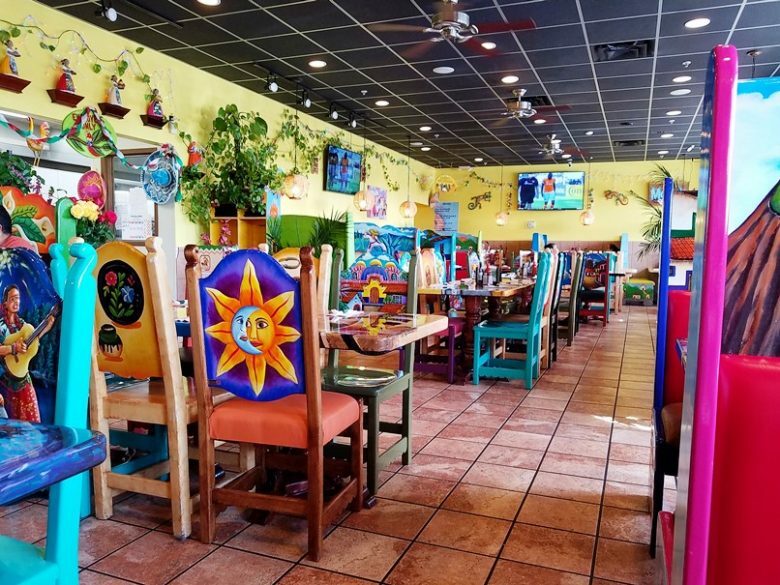 After you take in all the color and decor at Las Marias Tacos y Pupusas, grab a seat and peer through their deep menu. It’s multiple laminated pages and covers a variety of appetizers, dishes in beef, pork, chicken along with seafood specials. Or go the tacos and burritos route. 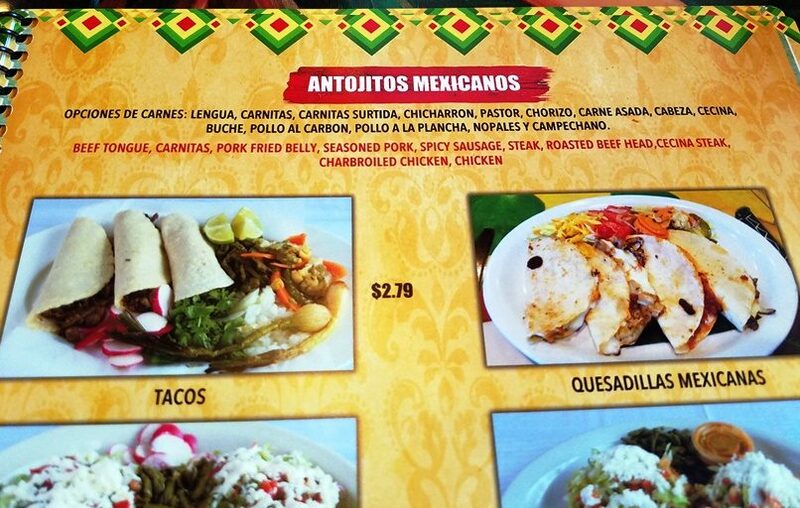 And while Las Marias focuses on more authentic eats, they also have a page of Tex-Mex selections including fajitas and quesadillas, phew! 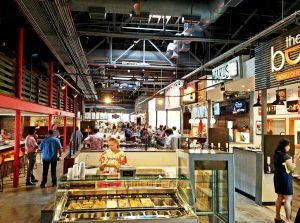 It’s a huge array of possibilities while you dine here. 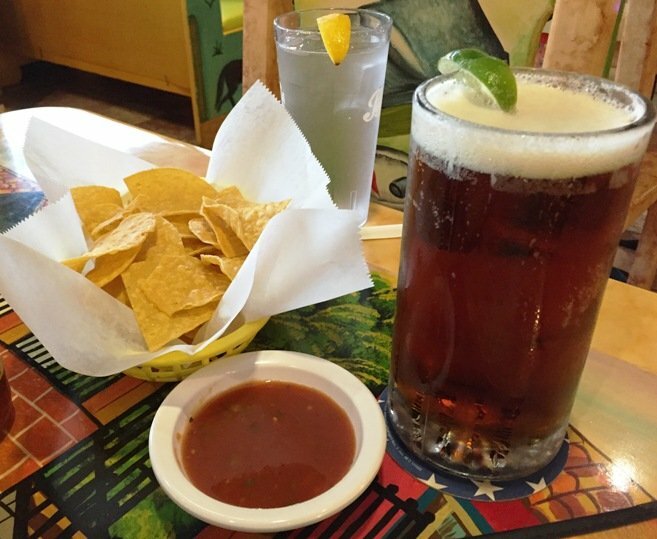 Beer and margaritas are also available if you are imbibing. Looking around the dining room you’ll also find that the majority of the patrons here appear to be Mexican which is always a good sign for this foodie! Over the course of my visits I’ve had the chance to sample several items off the menu. First, I had to try the pupusas given the name of the restaurant. Las Marias offers up a beautiful, pan-fried and griddled corn cake stuffed with some delicious melty cheese. It’s a tasty little starter served with some lightly pickled cabbage on the side along with a spicy side sauce. Very well done and filling, you don’t find a ton of pupusa options in the area. Tacos at Las Marias are an affordable $3 each and are offered up in a variety of meats! More choices than I’ve seen at other Mexican taquerias, you can choose from: carne asada, chorizo, carnitas, al pastor, chicarron, pollo al carbon, lengua and more. I go with my favorite carnitas and while the price may seem a bit high for a taco, they are piled high with meat, shredded lettuce and topped nicely with a generous sprinkle of fresh cotija cheese! Definitely a mouthful, if you can put down more than three of these bad-boys, you have my respect. And finally I had to try a burrito off their menu so I went again with the carnitas in their Macho burrito. Why is it called the “macho” burrito? Well the wait-person nicely cautioned me that it would be pretty spicy and is that ok? Of course I’m all in at this point and I’m not too concerned given I’m a fan of Indian and Thai food. My macho burrito comes out and it’s a nicely sized, thick burrito filled with crispy carnitas, rice, pinto beans, and more. Covered with some red sauce, melted cheese and some veggies as sides, you’ve got yourself a nice meal. Biting into the burrito you’ve got a filling mix of carbs, pork and spice and yes, it is spicy! 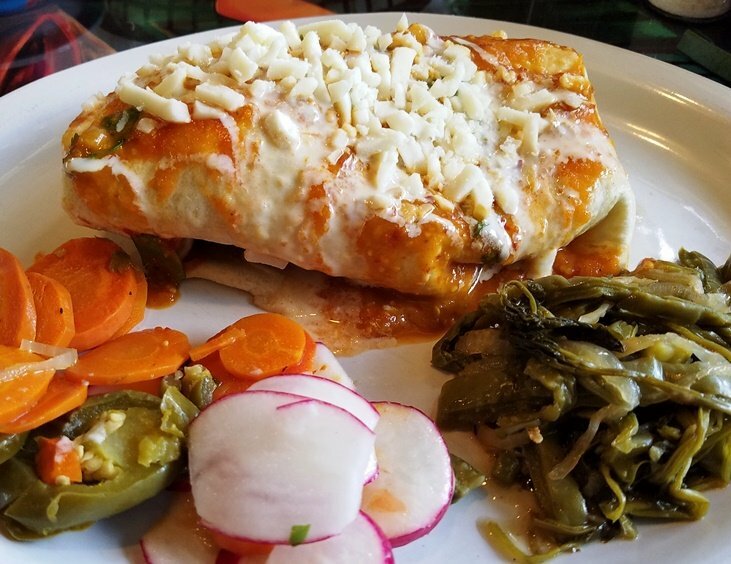 While it doesn’t hit you at first, over the course of my meal I start getting the sniffles and realize we’ve got a solidly spicy burrito here, be forewarned! Service at Las Marias Tacos y Pupusas is excellent, the staff is primarily female and personable. You’re seated promptly and the wait-staff is patient enough to work with you through their large menu. 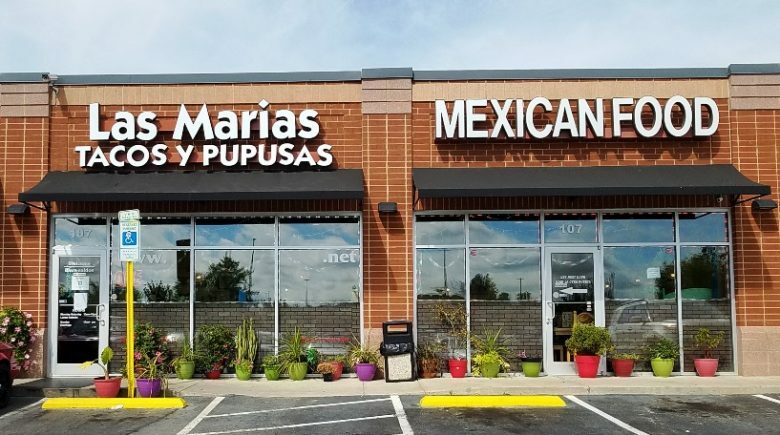 So kudos, Las Marias Tacos y Pupusas! While I may miss the old Fonda y Birriera Jalisco, you’re doing Mexican eats just as well and have kept most everything that made it good. 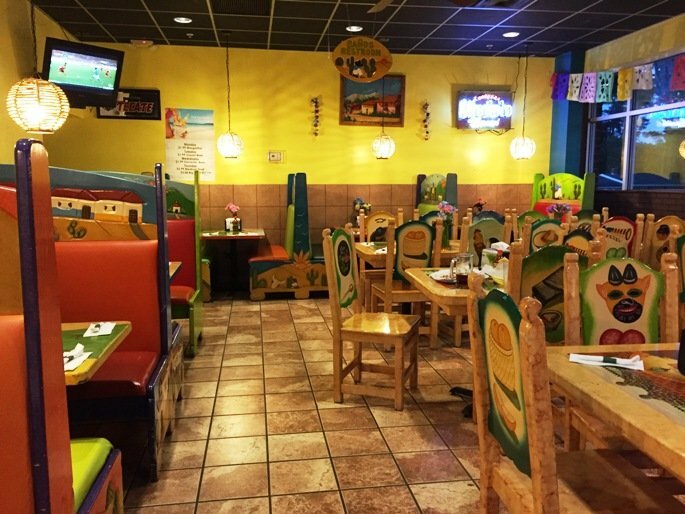 You’ll still find tasty, authentic Mexican cuisine for a reasonable price in a bright and cheery dining room. I’ll be back soon to take another stab at that huge menu of yours but I’m pretty sure that whatever comes out of your kitchen is going to be muy excelente!